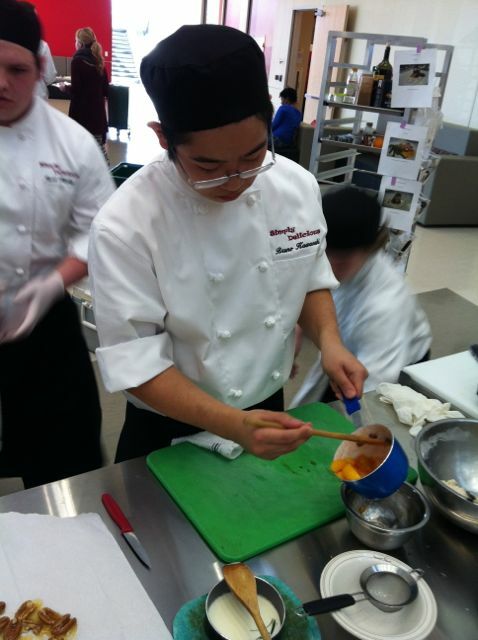 A student from North Pulaski High School’s Simply Delicious restaurant competing last week. North Pulaski’s team won the culinary competition. If the weather outside hasn’t caught on that it’s almost spring, the event calendar is getting the hint. This time of year brings back some of our favorite food-themed competitions and events. Thursday, six culinary teams were set up in the institute’s open atrium, each at a professional workstation. Each team presented a multi-course menu to a team of judges, and I got to watch some of the cooking action. These guys and gals had it going on. In the end, North Pulaski High School’s Simply Delicious restaurant team won the culinary competition. On Friday, Northwest Arkansas Community College Early College Experience won the hospitality management competition. Both teams will advance to the national ProStart competition. Tomorrow, the Diamond Chef preliminary competition takes place from 2 – 8 p.m., also at Pulaski Tech CAHMI. This free event is to identify this year’s competitor against last year’s champion, Chef Dan Capello of Chenal Country Club, in the ticketed final event on June 3 at the Statehouse Convention Center. Heat 1, 2pm: Chef Ducrot of PTC Culinary Arts and Hospitality Management Institute vs. Chef Coby Smith of Arkansas Heart Hospital. Heat 2, 3:00pm: Chef Marc Guizol of the Capital Hotel vs. Chef Elliot Jones of YaYa’s. Heat 3 at 4p: Chef Jason Morell of Starving Artist vs. Chef Payne Harding of Cache. The final two rounds after that will determine this year’s competitor.